Fraction: A part of a whole is known as fraction. It is written in the form of `p/q`, i.e. in the form of numerator and denominator. Following are some examples of fraction. We need the use of fraction when we have to denote a part of whole. For example when we have to denote half, quarter, three out of four, six out of 9, etc. of an object, we denote it using fraction. Suppose we divide a cake in 8 equal parts, and we have to denote 3 parts of that, then it is denoted by fraction. `1/2` means one out of two. `1/3` means one out of three. `3/4` means three out of four. A fraction has two parts. One is numerator and second is denominator. 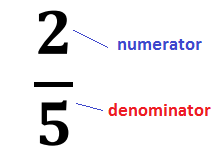 Here; 2 is numerator and 5 is denominator. Denominator shows the total parts and numerator shows the number of equal parts. In this fraction there are total 5 parts. The fraction shows 2 out of five parts. Consider the figures given here. Each figure has been divided into five equal parts. Proper Fraction: Fraction which represents a part of a whole is known as proper fraction. In a proper fraction; numerator is smaller than denominator. Following are some examples of proper fraction. Improper Fraction: Combination of whole and a proper fraction is called improper fraction. In an improper fraction; numerator is greater than denominator. Following are some examples of improper fraction. Mixed Fraction: The sum of a whole and a proper fraction is called mixed fraction. Following are some examples of mixed fraction. IMPORTANT: An improper fraction can be written in the form of mixed fraction. A mixed fraction is also called mixed number. Reciprocal of Fraction: When the numerator and denominator of a fraction is reversed or interchanged, the fraction we get is called reciprocal of fraction. In this fraction, 3 is the numerator and 5 is the denominator. After interchanging the numerator and the denominator, we get above fraction. When a fraction and its reciprocal are multiplied we get 1 as produce. Thus, the product of fraction and its reciprocal is always 1. Hence, the reciprocal of a fraction is also called multiplicative inverse of the fraction. Invisible Denominator: : If we divide any number by 1, we get the number as result or quotient. Therefore, any number can be written in the form of fraction by writing 1 as denominator. Writing a denominator with a whole number does not change the value of the given number.